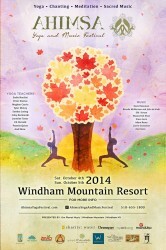 I am thrilled to be a part of this year’s Ahimsa Festival in Windham, NY. It is a two-day festival celebrating yoga and music. Ahimsa will promote traditional and emerging yoga styles, provide beautiful music in a green setting while providing you with access to emerging conscious companies and innovations in yoga. Click HERE for more information about the event and how to register. Tickets available on BrightStar Events. LIKE them on Facebook.